Capri, Naples is a popular resort island in the Italian region of Campania. According to new owner of Capri Trattoria & Pizzeria Fabrizio Anzolin, the idyllic decor of the Bukit Timah restaurant will particularly appeal to those who have toured Italy and been one of the gourmands in the culturally rich country. When seated at one of the 15 tables (like the lone Seth in the picture on a quiet Tuesday afternoon) of this small outfit exhibiting attendant bric-a-brac on its brick mantle and seashell-ridged sand-white walls, you can expect to receive the full attention of Fabrizio and his dedicated team while chiming to the mellow classical Italian playlist. 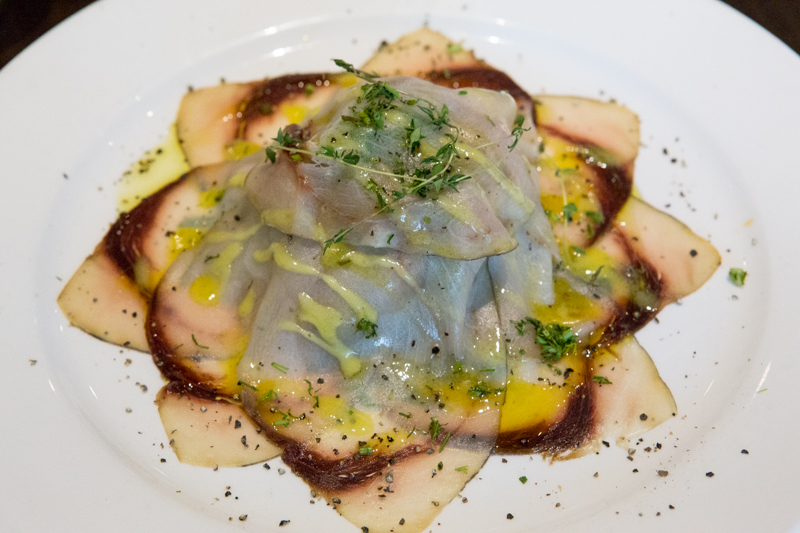 Carpaccio di pesce ($20++). The first antipasti was this raw swordfish carpaccio drizzled with citronette sauce portrayed like a multi-spiked shuriken atop a bed of rocket salad. Salty and fresh, these thin springy slices of swordfish will likely waltz a little in the mouth before digestion. Burrata con prosciutto crudo ($38++). Burrata cheese does have some semblance of poached egg, but the former certainly necessitates more immaculate preparation. 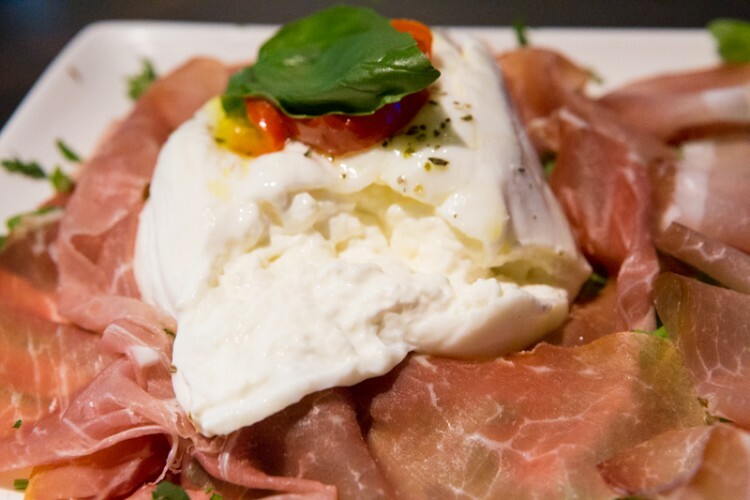 Quite filling is this snowy cheese sphere that sits in the middle of a parma-ham-strewn plate. Truly a work of art and another classic Italian serving. Gamberi e cappesante alle erbe ($20++). Warm prawns and scallops with mediterranean herbs. Locally imported prawns as Fabrizio tells us, is guaranteed to be much fresher than unrealistically relying on Italian consignments. 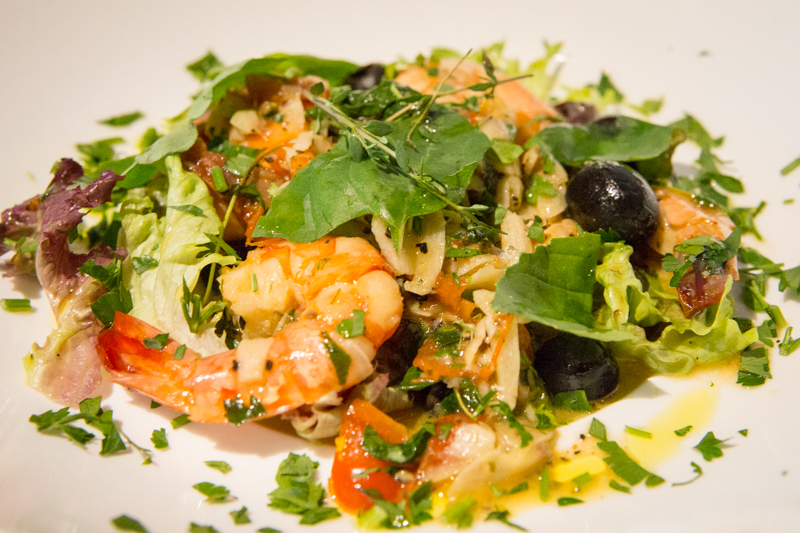 With this in mind, I really liked the warmth in this prawn salad amid refreshing garlic, olives, and parsley. Fettuccine alla piemontese ($28++). 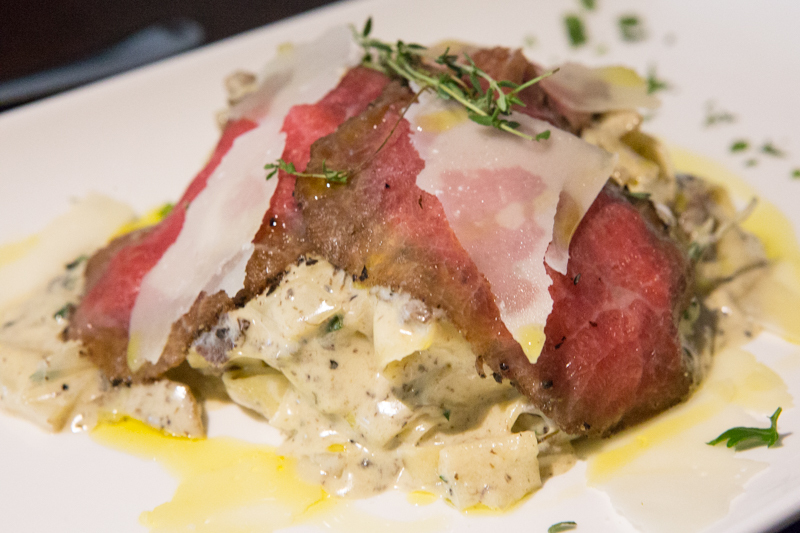 In this creamy pasta, soft homemade fettuccini is blended with self-cured pork sausages and mushrooms, and topped with beef bresaola and cheese with a touch of cream and truffle sauce. 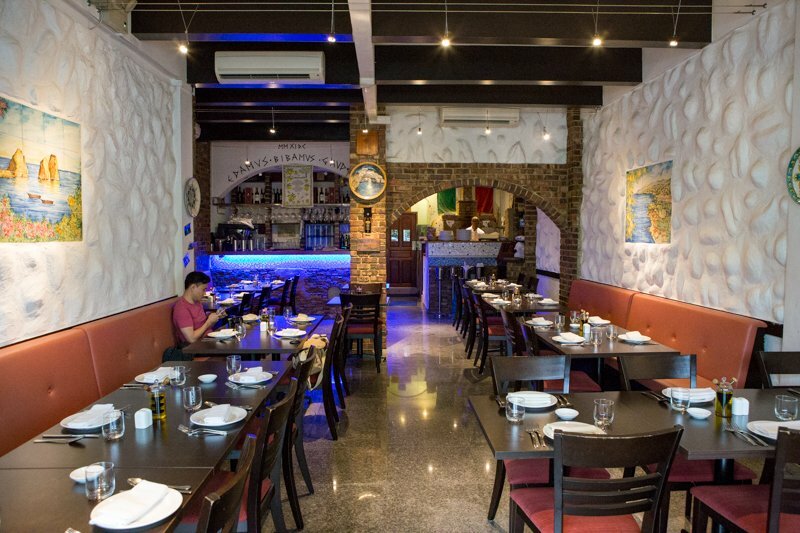 As with other trattorias, you will be allowed to dictate the firm finish of the pasta, which we found to be exceedingly tender in this case of fettuccini that resembles the texture of mee pok. Otherwise, it would have made for an excellent creamy dish with that salty touch from the bresaola adding some dimension to the cream base. Focaccina al tartufo ($8+). 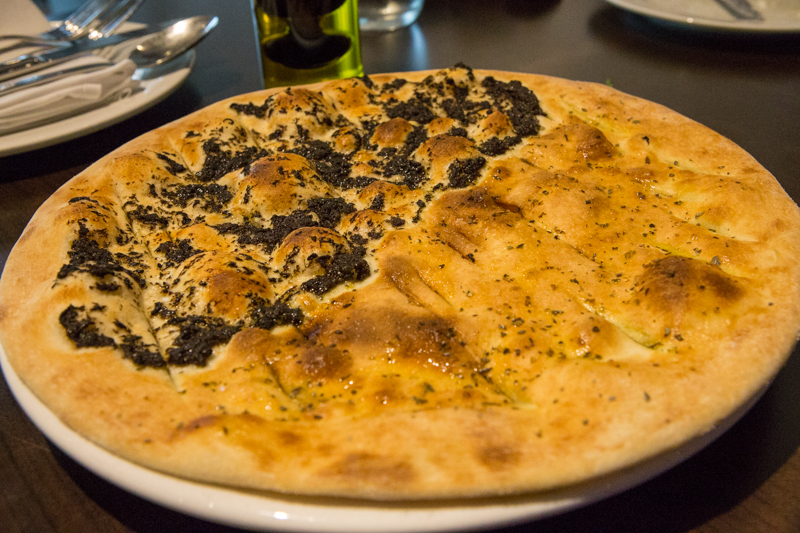 Thin, crispy focaccia bread topped with truffle paste. The bread is a bit on the dryer side but still enjoyable to savour the fragrant black truffle paste spread all over the crispy surface. Just drizzle a little bit more olive oil to enjoy the fluffiness of the homemade focaccia. Salsiccia alla calabrese ($28+). 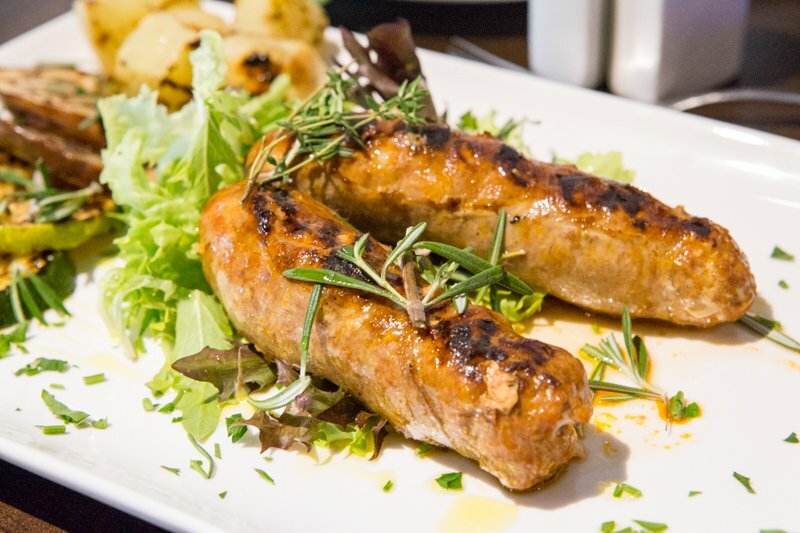 A brilliant tinge of spiciness in these homemade pork sausages that are cooked with herbs like paprika gives each wholesome bite a fragrant and mildly zesty kick that is undeniably delicious. Very meaty with heavy porkiness and is definitely recommended for meat lovers. Along the sausages lie mixed salad and grilled potatoes. Anacapri ($25+). 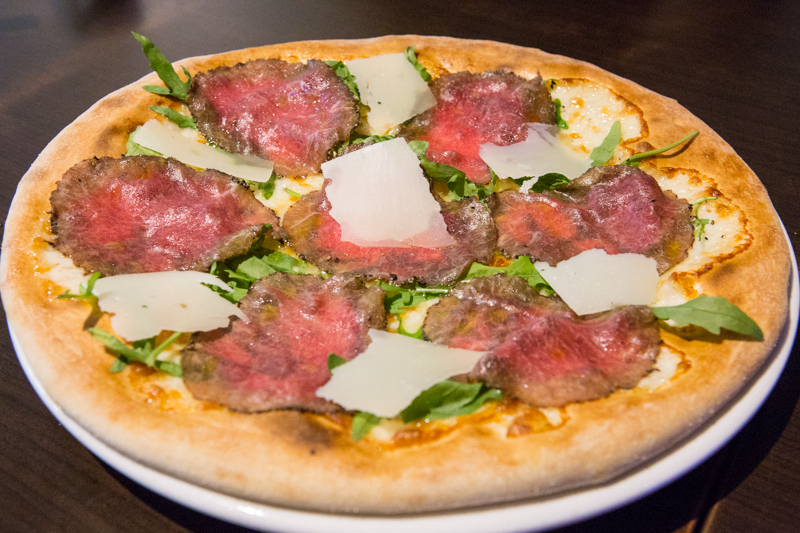 The Australian-flown beef is sliced to perfection and authentically blends with the mix of cheese and rocket to possibly imply a high standard in the restaurant’s other pizzas. The Sicilian-style crust here is soft like the focaccia bread, stretchy and fluffy, but could have used a bit more char on the base. 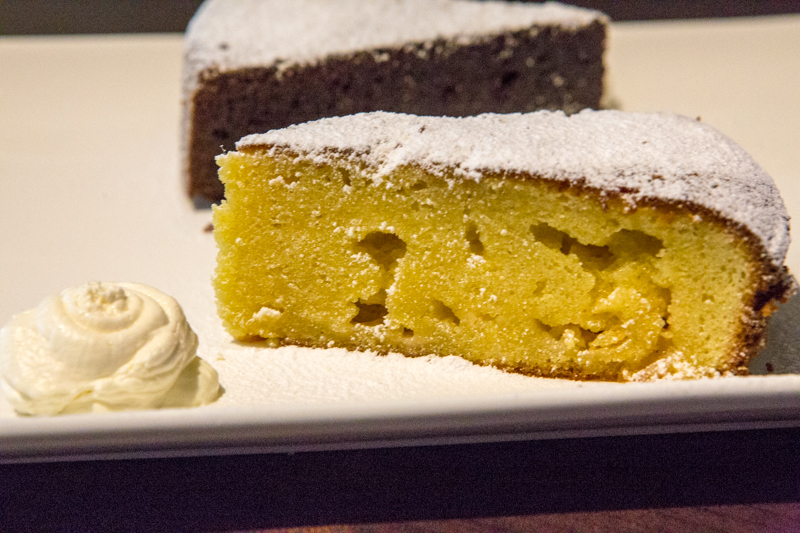 Torta Al Limone ($10+). This triangular blob of lemon cake has just the touch of sourness within the underlying sweetness that is largely fruity. Its fullness melts in the mouth for a truly soothing effect. Torta Capresse ($10+). 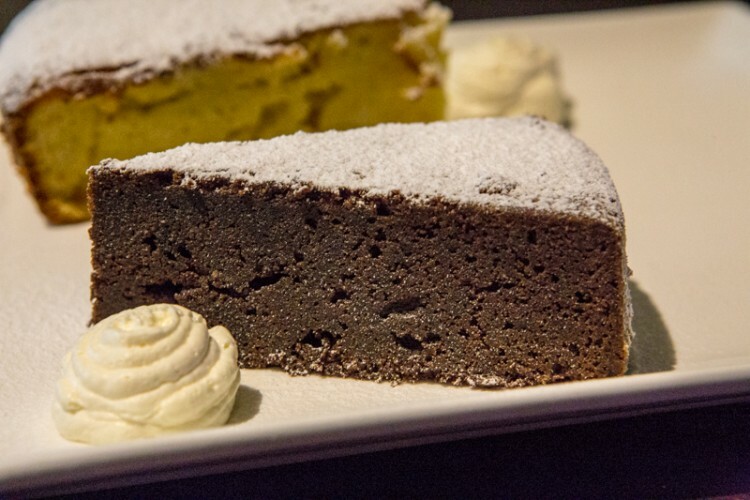 I next tried the adjacent chocolate cake of a rich coffee brown that had just the right moisture to go with the gentle flow of dessert, though its flavour pales in comparison to the lemon cake. Sicilian Gelato ($6+). 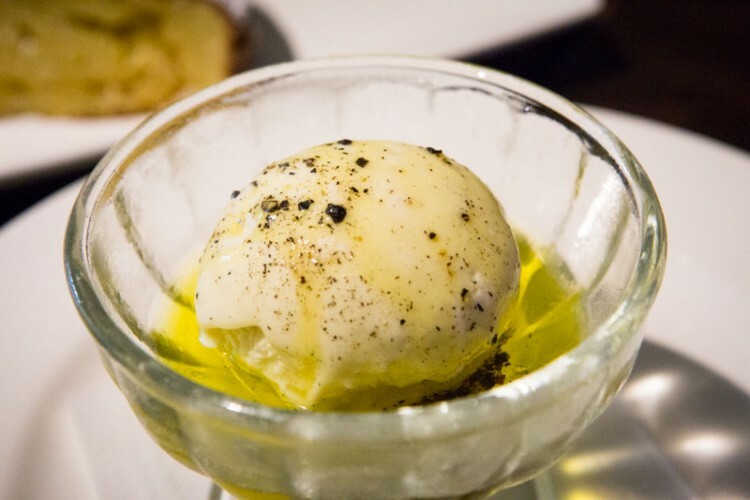 An original concoction of a scoop of vanilla ice cream generously dressed with pepper resting in an extra virgin olive oil bed was too intriguing to pass up. Indeed, I found this ingenious medley of sweet frost, spice, and fragrance to be a toothsome remake of ice cream. 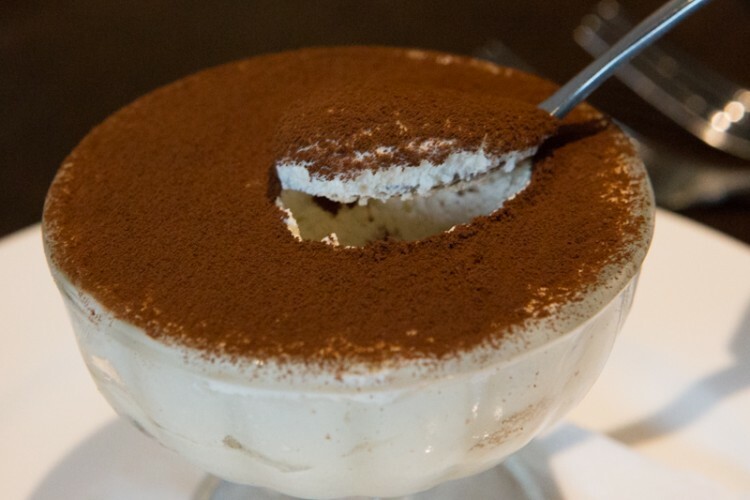 Tiramisu ($10+). Served in an inverse dome, one can initially see only a sea of white underneath the field of cocoa powder. Upon tasting of the near homogeneous blend of cream and mascorpone cheese, the tiramisu was rated to be very respectable. If only a stronger presence of coffee liqueur was found. Panacotta con amarena ($10+). 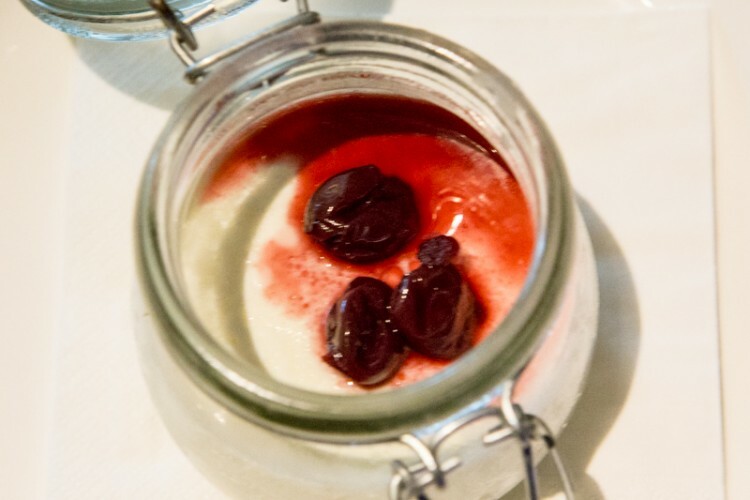 A near even distribution of sweet and sour accentuates the intrinsic berry essence of this pana cotta with an excellent consistency that charmingly closes the meal. For today’s deluge of ristoranti, Capri managed to pull off for us an impressive lineup that is reasonably priced. If you drop by, you might be able to learn a thing or two about Italy from Fabrizio Anzolin, who is most proud of Capri’s authentic lineage.